As seen by Michael Spence. we need a commission of top industry professionals and academics to address the challenge of measuring and detecting systemic risk and provide the underpinning of an effective “early warning” system. I see little hope of creating any kind of "early warning" system, if by that Mike means better forecasting. Crises like the current one are inherently unpredictable. If they were predictable, hedge funds and other money managers would not lose so much money during them. True, a few people were sounding an alarm in advance of the current crisis: Nouriel Roubini, in particular, comes to mind. And a few hedge funds have made money during the crisis. Yet that fact is not very meaningful. Given the diversity of opinion at any point in time, someone will always look right ex post. The key question is whether the event is reliably predictable ex ante. Policymakers at the Fed and Treasury cannot do better than rely on the consensus judgment of experts, and a couple years ago the consensus opinion was not predicting anything like what is now occurring. To suggest a regulatory system that gives an "early warning" is like saying we need to find a better crystal ball. Good luck with that. In my view, the key to regulatory reform is not trying to predict the future with more accuracy but, instead, making the system more robust so that the economy functions better when the unpredictable inevitably occurs. In other words, our focus needs to be not on what will happen but on what might happen. Click here to read my essay appearing in tomorrow's New York Times. David Brooks channels Harvard's Michael Porter. 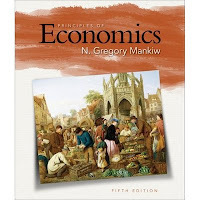 If you are looking for a gift for someone you think should learn a little economics, check out this new book by Nariman Behravesh. The book lives up to its subtitle: "A No-Nonsense, Non-Partisan Guide to Today’s Global Economic Debates." Nariman Behravesh is chief economist at Global Insight, the economic analysis and forecasting firm that evolved from Otto Eckstein's DRI and Larry Klein's Wharton Econometrics. About thirty years ago, Nariman was my boss, when I spent a summer as an intern at the Congressional Budget Office. I learned a lot working for him, and now, through this book, many other people can as well. As I post this, the book is number 41,218 in the Amazon sales ranking. I hope a little free advertising on this blog manages to improve that a bit. It deserves to be much higher. Update, same day, about 15 hours later: The book is now up to number 998 at Amazon. A nice demonstration of the power of the blogosphere. In our judgment, based on experience elsewhere in American industry, the most constructive role the government can play at this point is to provide a short-term infusion of capital with strict repayment rules that will essentially require the auto makers to sell off their assets to other, successful companies. Who are the most exploited workers in the American economy? The University of Chicago's Allen Sanderson has an answer. Like Paul, I am impressed by the new economic team. I know best the three economists coming from academia--Larry Summers, Christy Romer, and Austan Goolsbee--and they are all first-rate. They are excellent choices. Judging by this objective criterion, it looks like the two adminstrations are drawing economists from roughly the same talent pool. Of course, if one defines "grownup" as a person who agrees with Paul Krugman, and "hack" as a person who does not, then one might come to a different conclusion. NYU economist Tom Cooley wants to Prime The Pump With Education Spending. My one addendum: As we're doing this, let's not forget to buy a lot of textbooks. President-elect Barack Obama vowed on Tuesday to cut billions of dollars from wasteful government programs....An obvious example, Obama said, were reports of crop subsidies to farmers who make more than $2.5 million per year. Like President-elect Obama (but unlike candidate Obama), I am all for getting rid of farm subsidies. But why would you want to use taxpayer funds to encourage large, efficient, profitable farms to break up into smaller, less efficient, less profitable farms? Isn't that precisely what you do if you maintain subsidies only for small farmers? As all ec 10 students know, competitive markets push firms toward the efficient scale, defined as the level of production that minimizes average total cost. The low costs are in turn passed on to consumers in the form of low prices. These conclusions no longer hold true, however, if government policy tilts the playing field by rewarding small scale. Note that the ostensible goal of the program---restricting the amount of government subsidies paid to large farmers---has not been achieved.When the large farmers rent their land to small farmers, the market price of the rents depends on the generosity of the Federal subsidies.The higher the subsidies, the higher the equilibrium rent the large farmers receive. The benefits from the subsidy program still falls on those who initially own the land, since it is ultimately the value of what the land can earn---either from growing crops or farming the government---that determines its market value. Thanks, Hal, for sending this in. You know times are tough when the rich start cutting costs on their mistresses. According to a new survey by Prince & Assoc., more than 80% of multimillionaires who had extra-marital lovers planned to cut back on their gifts and allowances. Still, only 12% of the multimillionaire cheaters said they plan to give up on their lovers altogether for financial reasons. As seen by Martin Baily, Bob Litan, and Matthew Johnson. As seen by Bob Hall and Susan Woodward. President-elect Obama plans to name Christina Romer... to chair his Council of Economic Advisers. Facing an increasingly ominous economic outlook, President-elect Barack Obama and other Democrats are rapidly ratcheting up plans for a massive fiscal stimulus program that could total as much as $700 billion over the next two years....Obama has set a goal of creating or preserving 2.5 million jobs by 2011. Dividing one number by the other, that works out to $280,000 per job. Update: Readers have sent me several suggestions for how to reconcile the multiplier numbers. First, annual GDP per worker is larger than the $50,000 figure implicit in the above calculation. Second, because of labor hoarding in downturns, the percentage change in GDP could be larger than the percentage change in employment. Third, part of Obama stimulus may take the form of tax cuts rather than spending hikes; the traditional Keynesian multiplier for a tax cut is about 1.2 rather than 2.0. Finally, as I noted in my original post, the Obama plan could well be less than $700 billion. All good points. 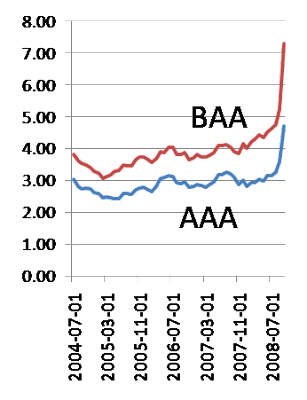 This figure, from Menzie Chinn, shows log real GDP, from 26 Sep 08 final release (red), from 30 Oct 08 advance release (blue), potential GDP (black), the mean forecast from the Wall Street Journal's October survey of forecasters (pink circle), and from the November survey of forecasters (teal triangle). Real GDP a year from now is forecast to be about 5 percent below potential. Larry Summers is going to be director of the National Economic Council. 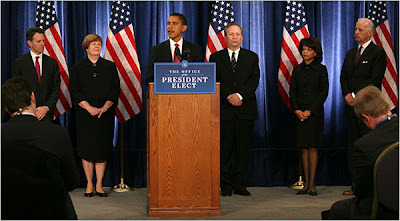 I wonder: What role will the Council of Economic Advisers have in the new Obama administration? And how will the CEA and NEC get along? When I worked for President Bush as CEA chair, the NEC and CEA had distinct and complementary roles. The CEA was staffed by professional economists, many from academia, whose expertise was economic analysis. By contrast, the NEC was staffed by those with experience on Wall Street and Capitol Hill. The NEC's main role was to coordinate the policy process, to act as an honest broker, to make sure that all points of view were heard, and to facilitate discussion among the relevant departments so all felt they had a fair shot to make their case. Steve Friedman, formerly of Goldman Sachs, ran with NEC with impressive intelligence, humility, and diplomacy. But the situation will likely be very different with Larry as head of the NEC, and perhaps Jason Furman as his deputy. Their skill set will overlap substantially with the three members of the CEA. In other words, the NEC and CEA will be more like substitutes than complements. Only time will tell how well this alternative organizational structure will work. As the above graph illustrates, the relationship between Treasury securities and inflation-indexed bonds has been very odd of late. 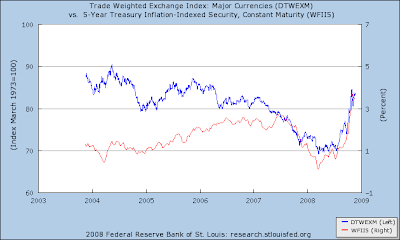 The blue line is the yield on 5-year nominal Treasuries. 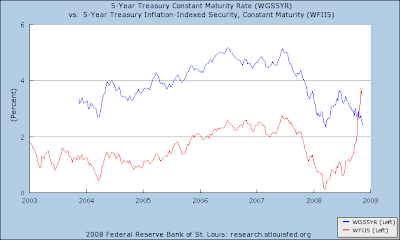 The red line is the yield on 5-year inflation-indexed Treasuries. Had an interesting discussion with [xxxxx] about the odd recent behavior of indexed-bond rates. The basic idea is that, in the present environment, nominal Treasuries have a negative beta. If we go into Depression, the expectation is that this will be accompanied by substantial deflation, so that Treasuries will do well in real terms. In contrast, the typical pattern is different--perhaps bad times are usually accompanied by high inflation or at least average inflation. Therefore, especially at the shorter end, the relation between indexed and conventional Treasuries has shifted--the real rate on indexed bonds now has to be well above the expected real rate on nominal bonds. This observation also means, particularly at the shorter end, that the spread provides little information about expected inflation. Of course, there are also liquidity stories, concerning the thinness of indexed bond markets. But I don't think this would apply particularly to shorter maturities. And the market has always been relatively thin. For those of you who teach macroeconomics, here is a question to spark class discussion. You observe an economy sinking in recession. As this occurs, real interest rates are rising, and the currency is strengthening. What shock, or set of shocks, could have caused these events? Thanks to my friend Mark Showalter for sending this in. On Sunday, President-elect Barack Obama asked, "What does a sustainable U.S. auto industry look like?" Well, it looks a lot like the automotive industry run by "foreign" car companies that insource jobs into the U.S. In 2006 these foreign auto makers (multinational auto or auto-parts companies that are headquartered outside of the U.S.) employed 402,800 Americans. The average annual compensation for these employees was $63,538. Will fewer companies look to insource into America if the federal government is willing to bail out their domestic competitors? The answer is an obvious yes. 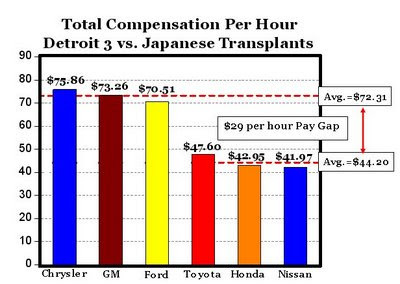 Ironically, proponents of a bailout say saving Detroit is necessary to protect the U.S. manufacturing base. But too many such bailouts could erode the number of manufacturers willing to invest here. Here is a website that analyzes blogs and, supposedly, tells you the blogger's psychological profile. INTJ - The Scientists The long-range thinking and individualistic type. They are especially good at looking at almost anything and figuring out a way of improving it - often with a highly creative and imaginative touch. They are intellectually curious and daring, but might be physically hesitant to try new things. They are intellectually curious and daring, but might be physically hesitant to try new things. Better than many people think. This picture, courtesy of Johns Hopkins econ prof Chris Carroll, shows the correlation of the stock market's price-earnings ratio (where earnings are a 10-year average) and the subsequent real return on equities. The point labelled 1996 is the era dubbed "irrational exuberance." The bottom line: Right now, the expected inflation-adjusted return is about 6 percent. Michael Kinsley is Pro and Stanley Fish is Con. Jeff Sachs is Pro and Gary Becker is Con. You can't avoid them. But sometimes more of one means less of the other. Higher taxes on alcohol can make a night out more expensive but could save lives, according to a study released Thursday. Each time the state of Alaska raised its alcoholic beverage tax, fewer deaths were caused by or related to alcohol, according to the study that examined 28 years of data. When Alaska raised its alcohol tax in 1983, deaths caused by or related to alcohol dropped 29 percent. A 2002 tax increase was followed by an 11 percent reduction, according to the study published in the American Journal of Public Health. Nearly half of the states have had the same alcohol taxes for more than 20 years, and Wyoming hasn't raised its tax on alcohol since the 1930s, thus not keeping up with inflation. SCORES of Russians have died and more than 900 have been treated in hospital after drinking home-brewed spirits and illicit substances, following the introduction of a new tax on vodka. Rising prices of legitimate spirits have created a booming market in illegal vodka and a range of substitutes including lighter fluid, cleaning fluid and industrial alcohol. The economy is in tatters and, for millions of people, the future is uncertain. But for some employees at the Hormel Foods Corporation plant here, times have never been better. 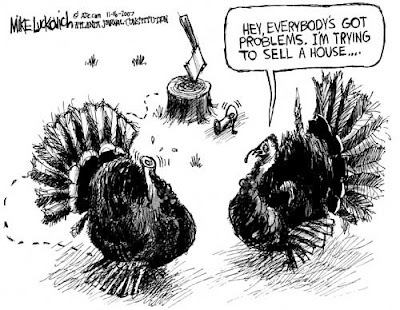 They are working at a furious pace and piling up all the overtime they want. Even as consumers are cutting back on all sorts of goods, Spam is among a select group of thrifty grocery items that are selling steadily. Pancake mixes and instant potatoes are booming. So are vitamins, fruit and vegetable preservatives and beer, according to data from October compiled by Information Resources, a market research firm. Economics students will recognize these as inferior goods: Goods for which demand rises when income falls. Note: "Inferior" is not a pejorative, just a description of the sign of the income elasticity. The President gives his take on the challenges we face. Nicholas Kristof channels Claudia Goldin and Larry Katz. Note: There will be a book party for Goldin and Katz on Tuesday. Tom Cooley and Lee Ohanian on how to fix the economy. "We are carefully evaluating programs which would further leverage the impact of a TARP investment by attracting private capital, potentially through matching investments," Treasury Secretary Henry Paulson said in a broad speech on the Troubled Asset Relief Program, known as TARP, the global credit crunch and the government's recent steps to address the financial meltdown. From University of Chicago economist John Cochrane. FYI, I asked John about the units for the returns in this figure. He tells me that it plots nominal returns, so "1" means 100% cumulative (not annualized) return for 7 years. This past Tuesday, many people voted for you hoping you would achieve the kind of economic success that Bill Clinton enjoyed in the 1990s. Your best chance of delivering what they want requires that you abandon some of your past positions and pursue a more moderate, bipartisan course. Tomorrow's NY Times includes an edited version of this article. After a while he says, "Do you believe in ghosts?" The way I say this makes John smile. "They contain no matter," I continue, "and have no energy and therefore, according to the laws of science, do not exist except in people’s minds." The whiskey, the fatigue and the wind in the trees start mixing in my mind. "Of course," I add, "the laws of science contain no matter and have no energy either and therefore do not exist except in people’s minds. It’s best to be completely scientific about the whole thing and refuse to believe in either ghosts or the laws of science. That way you’re safe. That doesn’t leave you very much to believe in, but that’s scientific too." In the past, economists of both the right and left opposed the military draft. Will they similarly come together to oppose conscription for community service? I hope so. The free man will ask neither what his country can do for him nor what he can do for his country. He will ask rather "What can I and my compatriots do through government" to help us discharge our individual responsibilities, to achieve our several goals and purposes, and above all, to protect our freedom? And he will accompany this question with another: How can we keep the government we create from becoming a Frankenstein that will destroy the very freedom we establish it to protect? Update: The presidential transition website to which I linked above no longer uses the word "require." The passage quoted above was copied and pasted from that website (with bolding added by me). But within a few hours after I posted it here, the wording changed to "setting a goal." I am delighted to see this blog having so much influence on the policies of the new administration. That's change I can believe in! Addendum: Click here for a shot of the original webpage. Says Harvard economist Ed Glaeser. Says Northwestern economist Tim Feddersen (in a piece published Tuesday, before the polls closed). 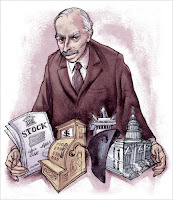 “President Summers asked me, didn’t I agree that, in general, economists are smarter than political scientists, and political scientists are smarter than sociologists?” [former dean Peter] Ellison told the Globe. 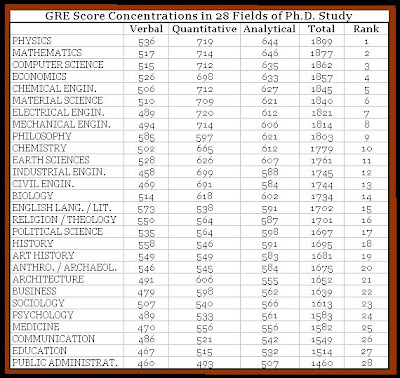 Here (via Mark Perry, posted two days ago) are GRE scores by field. Economists rank number 4. Political scientists are number 17, and sociologists are number 23. In last place is public administration. The NYU economist imagines change he can believe in. As seen by Robert Samuelson. If you are reading this blog, then you are well-informed, so voting is a civic responsibility. But what about those who don't read this blog? The answer is here. But there are at least 15,000 professional economists in this country, and you’re saying only two or three of them foresaw the mortgage crisis? It’s an enormous blot on the reputation of the profession. There are thousands of economists. Most of them teach. And most of them teach a theoretical framework that has been shown to be fundamentally useless. Like his late father, Galbraith the younger is highly critical of mainstream economics. This is noteworthy in part because Galbraith is listed as an Obama economic adviser. One of the more telling things to look out for in the coming weeks (assuming the seemingly inevitable Obama victory) will be which economists get which jobs in the new adminstration. Will the important positions be filled with people like Austan Goolsbee and Jason Furman, who are essentially mainstream economists with slightly left of center political views, or with heterodox economists like Galbraith who are deeply skeptical of the economics found in most textbooks? If the administration is filled with prominent members of both groups, the internal battles over the heart and soul of the new adminstration's economic policy should prove fascinating to watch. Over at Intrade, you can bet on future tax rates. 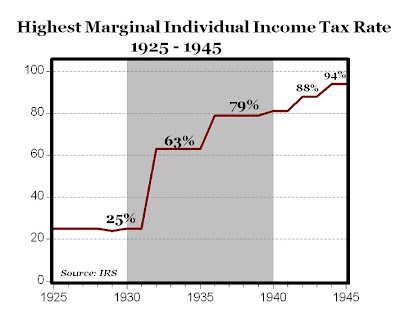 Currently, the implied probability of a hike in the top income tax rate in 2009 is about two-thirds. This surprises me. Even assuming an Obama victory, I would put the probability much lower. As an economic matter, raising anyone's taxes with the economy so weak seems ill-advised. 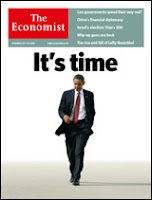 As a political matter, why not just let the Bush tax cuts expire at the end of 2010? Obama could then claim in four years that he never signed a tax hike. It seems neither economically nor politically sensible for the new President to push for an immediate tax increase, even if an eventual tax increase is his goal. 1. 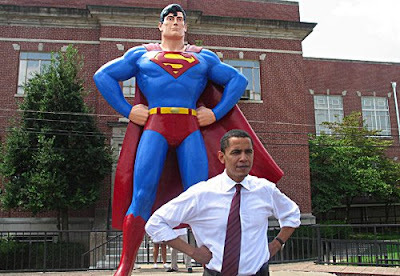 The Obama people are not as savvy as I think they are and will push for an immediate tax hike. 2. The Intrade market is so thin that the pricing there does not mean much. 3. Some people are using the Intrade market as a hedge. A high-income person bets that tax rates will go up and bids up the implied probability above the true probability. If the bet pays off, his winnings reduce some of the hit his after-tax income takes by the tax change. It is a form of insurance. Those traders on the other side of this bet--who win if taxes do not rise--are buying a high-risk asset, as measured by covariance with their consumption. They need to be compensated for taking this risk. Under this hypothesis, the Intrade price is not a good gauge of the actual probability but includes a substantial risk premium. I read with great interest the post on your blog today about how to interpret the prediction market price for the event of a tax hike in 2009. Tyler Cowen made a similar point about interpreting the market price for the event that Congress would approve a bailout before September 30. And, in fact, last May I wrote a comprehensive exam question for the Ph.D. students at Yale that revolved around this same observation in the context of an election prediction market. But I have seen no formal papers that make this point. I think it is a critical one for evaluating the usefulness of prediction markets in aiding decision-making. The general point that rational investors will use prediction markets to hedge risks can also help to explain an apparent puzzle throughout the recent election campaign: in particular, statistical models designed to predict election outcomes (see, for example, www.fivethirtyeight.com and David Stromberg's website) generally reported probabilities for an Obama victory that exceeded the corresponding market prices on both intrade and betfair. If we take seriously the predictions of these statistical models--that is, if we view them as giving an accurate estimate of the actual probability that Obama will win--then evidently investors seem to think that Obama will be relatively good for the economy compared to McCain, driving down the equilibrium price for an Obama contract (since this contract pays off when marginal utility is low). 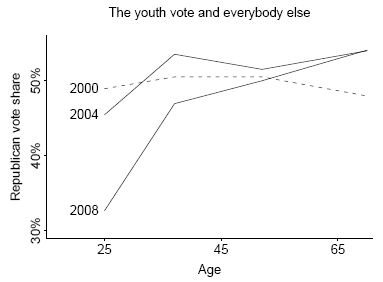 To help voters make an informed decision, maybe you should post this "evidence" on your blog! Economist Thomas Sowell really, really, really does not like the Democratic ticket. Yale economist Bob Shiller discusses why bubbles are hard to diagnose. Obama leads in 18 out of the 19 states with the largest recent declines in home prices, whereas McCain leads in 13 out of the 14 states with the largest recent increases in home prices. Click here to see the data. David Cutler and Brad DeLong make the case for the Obama health plan. Arnold Kling dissects their analysis. Every other North Atlantic country is healthier than America. That falls into the category I once described as "true but misleading statements about health care that politicians and pundits love to use to frighten the public."